Weld Racing wheels have taken their best drag wheel and made it even better. The Magnum Import Drag wheel picks up where the domestic drag race applications leave off. The Magnum Import Drag wheel is designed for front-wheel drive applications in 4x100mm and 5x100mm bolt patterns in a durable yet lightweight design. It carries the same unique features as the other Weld Racing Pro Drag wheels which include polished forged aluminum rim shells combined with 6061-T6 forged centers. The wheel flange is double rolled for added strength. 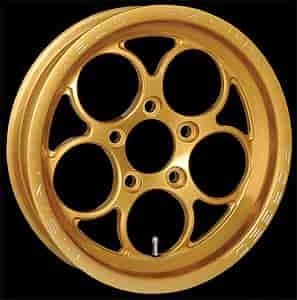 Thanks to the one-piece gold anodized center, the Magnum Import Drag Gold Finish Wheels are one of the lightest, strongest, and truest drag race wheels available today. This total drag race wheel is so balanced and so consistent that you will feel the difference your first pass. 766-Series are 5-lug shank/drive stud lug style wheel. 767-Series are 5-lug acorn/conical seat lug style wheel. 768-Series are a dual drilled style wheel for either 4-lug shank/drive stud or 4-lug acorn/conical seat lug.